The Post below appeared December 2nd on the Golfgal’s Blog, http://www.Golfgal-blog.com. I reprinted it because it is absolutely the best review of my book that I could imagine. I hope that you find it compelling. I’ve always thought that Ernie Els’ swing was poetry in motion.It looks completely effortless and rhythmic; some might even go so far as to say it is as smooth as Barbra Streisand’s legs… “Like buttah!” (Ooops, I think I’m dating myself 🙂 ).Anyway, back to golf…Except for my comments on The Big Easy, I don’t ever remember using the words poetry and golf in the same sentence. 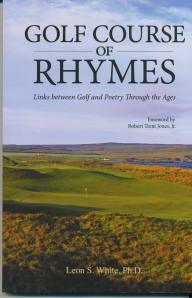 But since I discovered Leon White’s book, Golf Course of Rhymes (Links between Golf and Poetry Thought the Ages), I can see how poetic golf really is. Filed Under: golf, Golf Course of Rhymes, golf history, golf humor, golf poetry, golf poetry books, humor, poetry, sports poetry, The book "Golf Course of Rhymes" Tagged With: golf, golf history, golf humor, golf poetry, golf poetry books, humor, poetry, sports poetry, The book "Golf Course of Rhymes"